Charter Trains to Party Conferences & Demonstrations - Hire Trains with Lower Prices. 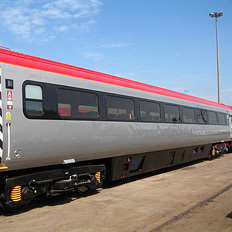 Trainhire.co.uk, the low-cost option for rail charters and booking large group travel, offers high capacity trains for hire across the entire British rail network, which are of particular interest to the organizers of party conference travel, demonstrations and planned marches. The process of hiring a train or arranging group travel bookings, tickets and fares is simple because Train Hire manages everything for the group organiser. A single contact handles the booking from start to finish, advising on costs and options, arranging the train travel. Long-distance journeys start from £35 per person for return travel. Buying together offers real negotiating power, with cheaper tickets and savings passed onto individuals travelling in the group. Private train hire allows direct travel to your destination in a reserved train, without changing on the way, even if the route would have normally required a change if regular public trains were being used. For large group train bookings on scheduled trains, Train Hire either reserves or attaches private rail carriages or arranges for the group to sit together in public carriages. 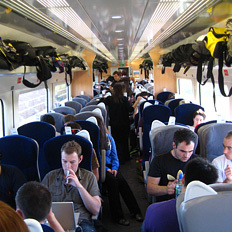 We have extensive experience in organising rail travel for large numbers of people on the way to a mass event, such as for the G8 / Make Poverty History campaign in Edinburgh with Oxfam, or trade unions such as the NUT (from the North West of England to London) as well as faith groups and other associations and organisations. Train Hire has access to most of the major London stations, such as Euston, Kings Cross, Victoria and Paddington from thousands of destinations throughout England, Wales and Scotland. We work closely with the Network Rail and train company station managers to coordinate efficient ground handling through the stations. Intercity rail travel to and from London with our rail chartering services is both easy and cost effective for group organizers. Train Hire will advise on whether to hire a private train or to use a public scheduled train service, depending which is the most cost-effective for the particular group and route. Simon Pielow of Train Chartering, the company behind Train Hire, says, "Train Hire has been designed for the growing awareness of group travel organisers that Britain's railways are a great way to take large groups long distances."